The Fermi National Accelerator Laboratory is still getting important particle work done, years after the closure of the Tevatron was announced. 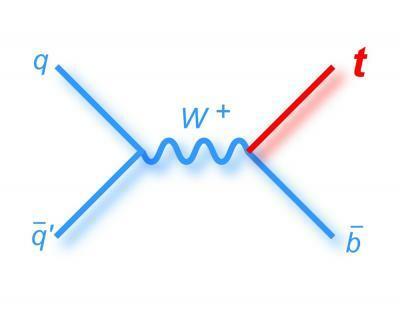 experiments have announced that they have found the final predicted way of creating a top quark, completing a picture of this particle that has been nearly 20 years in the making. The collaborations announced late last week that they had observed one of the rarest methods of producing the elementary particle – creating a single top quark through the weak nuclear force using the "s-channel." For the analysis, they sifted through data from more than 500 trillion proton-antiproton collisions produced by the Tevatron from 2001 to 2011 and identified about 40 particle collisions in which the weak nuclear force produced single top quarks in conjunction with single bottom quarks. Top quarks are the heaviest and among the most puzzling elementary particles. They weigh even more than the Higgs boson – as much as an atom of gold – and only two machines have ever produced them: Fermilab's Tevatron and the Large Hadron Collider at CERN. There are several ways to produce them, as predicted by the theoretical framework known as the Standard Model, and the most common one was the first one discovered: a collision in which the strong nuclear force creates a pair consisting of a top quark and its antimatter cousin, the anti-top quark. "This is an important discovery that provides a valuable addition to the picture of the Standard Model universe," said James Siegrist, Department Of Energy (DOE) Associate Director of Science for High Energy Physics. "It completes a portrait of one of the fundamental particles of our universe, by showing us one of the rarest ways to create them."